Himalaya Neem Tablet contains Nimba (Azadirachta indica) leaf extract as a key ingredient. Help alleviate the cell-damaging effects of free-radical. Assist in rejuvenating the skin and help to maintain healthy and glowing skin. Ideal for long-standing skin allergies and infections. Pregnant or lactating women, diabetics and people with known medical conditions should consult with a physician prior to taking dietary supplements. Consult the physician if symptoms persist. 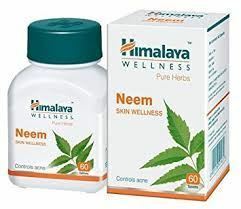 Himalaya manjishtha capsule is recommended for children ages 14 and above.